I entered politics in 1962 along with Ted Kennedy. Well, not exactly. Actually, I entered politics against Ted Kennedy. No, I was not for Edward McCormack, who was Speaker McCormack's nephew and was running against Teddy in the Democratic primary. And I was also not for George Cabot Lodge, Ted's G.O.P. opponent and descendant of many Massachusetts Cabots and Lodges going back to George Cabot, who served as the Bay State's United States Senator from 1791 to 1796. (The family still lives but not the party of its ancestors.) I actually supported H. Stuart Hughes, an intellectual historian at Harvard and the grandson of Charles Evans Hughes--Chief Justice of the United States and the 1916 Republican nominee for president against Woodrow Wilson. So there were four eminent scions in the race. Hughes was one of the first post-war peace candidates and ended up with 2.4% of the vote. The issue was not Vietnam. There were two issues then: nuclear disarmament and "fair play for Cuba." Hughes and Dr. Benjamin Spock, on whom many of you were raised, were co-chairmen of the National Committee for a SANE Nuclear Policy. The dyad attracted high-borns who disdained Teddy's father Joe and brothers Jack (by then president of the United States) and Robert (attorney general on the New Frontier); ideological sandal wearers; Quakers plus other pacifists; Communists and ex-Communists (yes, Virginia, there were Communists) and fellow-travelers who somehow decided they'd go politically underground during the Red Scare. It was folks like these who dominated the adult "peace movement" for several years until Gene McCarthy and masses of dissident Democrats came along. The child peace movement was, well, childish and destructive. Plus Abbie Hoffman, Norman Mailer and some professors. Actually wicked. The Cuban missile crisis intruded on the senatorial campaign and made Ted's victory inevitable. It was a time of high danger, but in America no one wanted to capitulate to what nearly everyone saw as Khrushchev's blackmail--and fraudulent blackmail, at that. I have to confess that Teddy, who was 30 at the time, seemed exactly 30 ... and more than a bit overwhelmed. And then the president was murdered, targeted on a hill in Dallas by a nut-case lefty. And some years later, on the night of his narrow victory over McCarthy in the 1968 California Democratic primary, Bobby was assassinated in a kitchen at Los Angeles' Ambassador Hotel--gunned down (dare we forget?) by one of the first Palestinian terrorists operating internationally. Sirhan Sirhan was his name, and it was he to whom Bill Ayers dedicated his book Prairie Fire. Then there was the Mary Jo Kopechne matter. Forty years ago. I have great sympathy. But I no longer judge. And who am I to judge anyway? I've read the biographies, his and those of his brothers. And of his father and mother. These are the most crucial. Even if you've read the most pious and flattering of them, you cannot believe that Teddy had an easy life ... or even a pampered life, which is not exactly the same. The father was a monster. The mother lived in another world--populated with angels, burdened with sin, relieved by prayer, animated by pieties, surrounded by priests ... The psychology of incoherence lived on among her grandchildren. 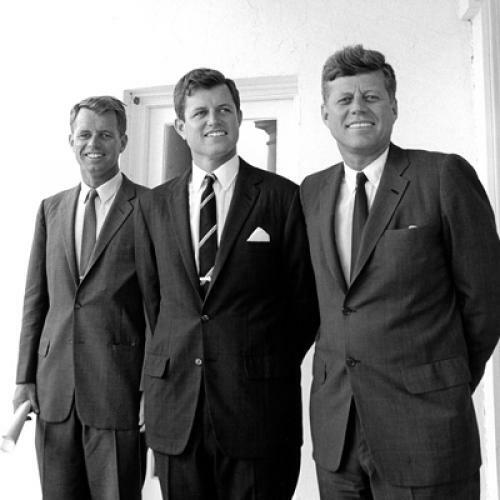 Senator Kennedy was burdened by his brothers. This may be a cliché. But he carried the burden soberly. I actually believe that he was more serious--or became more serious--than his brothers. While they had become idols before they were entitled to the station, he escaped it by his mishaps--by his failure, pre-eminently, to defeat Jimmy Carter, who was on his own way to defeat, both political and historical. But Ted, whom many considered shaky, was steady ... very steady. His brothers were born into privilege, and he matured into responsibility, rather more the ideal of responsibility than the responsibility of ideals which can blind you. He also worked extremely hard. He was lucky: he did not need to keep the Bay State home fires burning. He was a shoo-in every time he ran after 1962. What he worked on was his real work, the business of the United States Senate. So here he was, until the zillionaire class reached the Senate a decade or so ago, the richest person in that body. And I believe he was an egalitarian. On health care, on taxes, on education (the intricacy of which he probably was not sufficiently aware), he believed that the privileged must bear the burdens of the luckless and the unreasonably punished. Ted knew that we are bound to each other even if each of us does not know it. That is the purpose of law and of the law ... at least according to Edward M. Kennedy, the unexpected titan.